As things begin to heat up, Trina discovers that the circumstances of her late husband’s death are not what they seemed. Now she’s in trouble, and Wade isn’t about to let her out of his sight. Getting close to love and danger could get them killed… or it could sweep them both off their feet. This is the second book in the series, and you really do need to have read the first book to understand all the dynamics at play. This is a book full of drama and complex twists and turns, as well as a lovely romance – all in all, a very good addition to the series. I am reviewing with the assumption that you have read the first book. After the women supported Trina, she insists on travelling alone and we catch up with her in Venice, Italy. As she flies home, hoping to avoid meeting up with the FWC ladies, she goes via Miami, where she meets Wade. And that scene where they meet is just perfect – the timing, the humour, and the ignorance of his identity. It sets up a friendship which is a lovely feature of the relationship between these two. The drama comes from Trina's dead husband's Russian father – and it is complicated, but reads well – and as the gang rally round, and Wade also stays to support her, she starts to think that maybe it is time to live again. The honest communication between her and Wade is really engaging and works really well at cementing their relationship, even in these difficult conditions. Whilst this may concentrate on their relationship, it is a bigger story, and Avery in particular suffers from the Russian connection. I am hoping that she will get her happily ever after soon, but there weren't as many hints as I wanted! Great read – just make sure you read them in order. 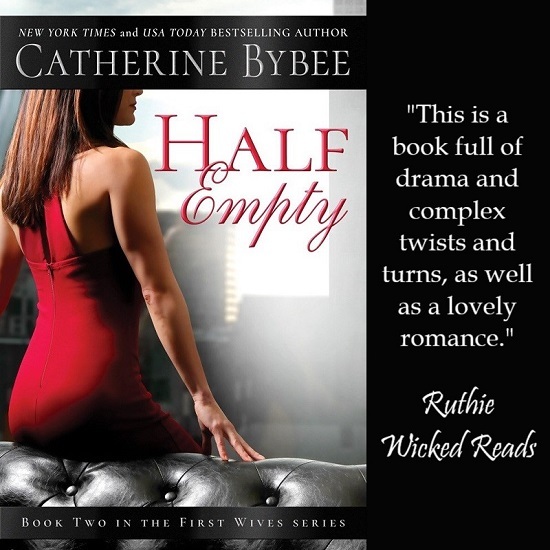 Reviewers on the Wicked Reads Review Team were provided a free copy of Half Empty (First Wives #2) by Catherine Bybee to read and review.